I've always loved the idea of sausage and peppers as an appetizer. 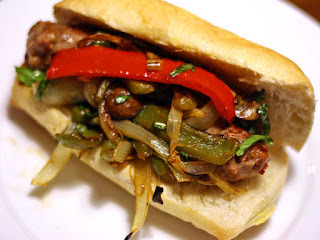 So when I realized I could make a sausage and peppers sandwich, I was hooked! The other day for a staff meeting at work, we brought out the grill and tried it out!! I was too excited though and forgot to take any pictures! I got the charcoal grill going and put the sausage in foil baking dish and put over the coals. This was for two reasons. I wanted to make sure I could slow cook all of the sausage without it burning or splitting, and I also wanted to capture the juices from the sausage to give the peppers and onions a bigger flavor. When everything is done, it's time to build some sandwiches! I used kaiser rolls for mine. French or Italian bread would work fine too. Add some spicy mustard or tomato sauce if you have it on hand!